Pirates, they’re a wacky bunch aren’t they. Ever since the acting chameleon that is Mr Depp first dressed up as a pirate everyone seems to have forgotten about the slavery, alcohol abuse, murder, and to put it politely, the slavery, abuse and murder of women. When some fey man prances around like Keith Richards and wears eye liner we all swoon and ignore their illustrious past. Pirates are now a hot property, so much so that they’re appearing in all sort of weird games on iOS, today’s game that features the wanderers of the sea is Potshot Pirates. 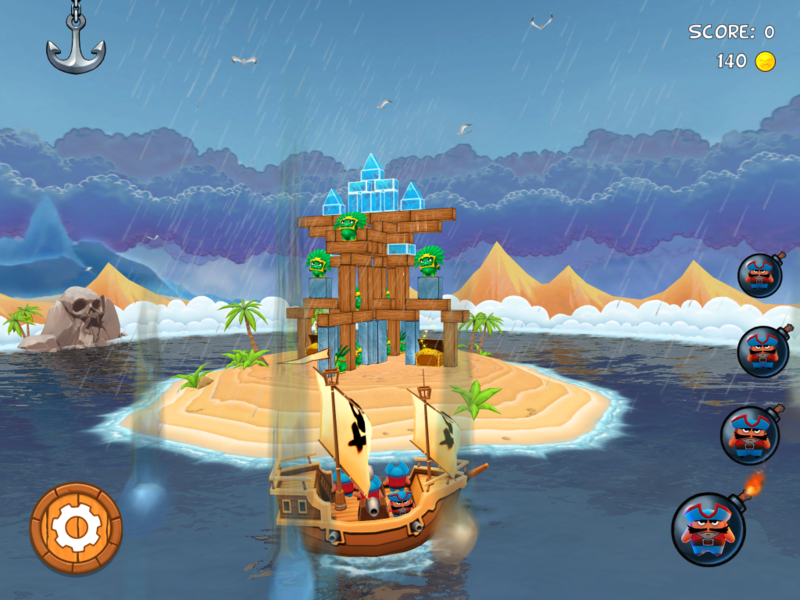 Potshot Pirates falls into an impressive crack in this reviewers mind, normally when I say a game is like another game I’m normally quite indifferent to this information, or down right negative. Potshot Pirates however is a great mix of Boom Blox and Angry Birds. Boom Blox for those that can’t remember 5 years ago, or anything on Wii, was the reverse Jenga game from the mind of Steven Spielberg, his actual involvement in the game I can’t testify, I didn’t see Tom Hanks in it so I’m pretty sure he was relatively hands off. 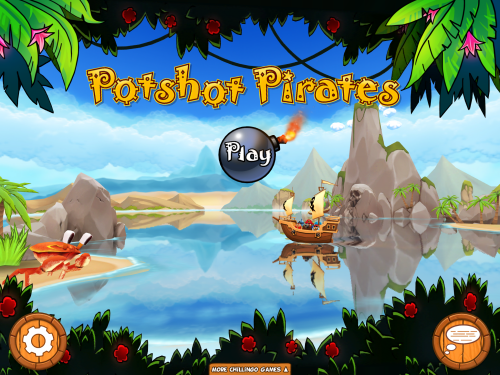 Potshot Pirates sees the play take control of a galleon, on each level you are stationed in the water just off the coast line with cannons. 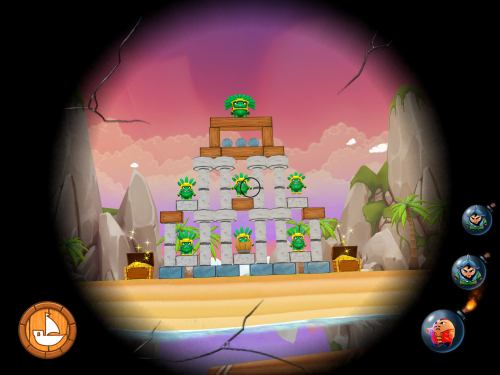 Your aim is to knock down the structures and primitive natives, who are inexplicably green fellas dressed like Incas, with as few cannon balls as you can. Amazing these structures are built with wood, stone, iron and glass. Somehow these locals have mastered glass and iron production but not glue or cement because like a house of cards if you knock out one area with a cannon ball everything collapses with a satisfying crunch. When preparing to shoot you are treated to a zoomed in scope view where one finger will control movement and the other will shoot. there is scope sway and aesthetically great cracks in the telescope, a simple but excellent addition to the theme of the game. 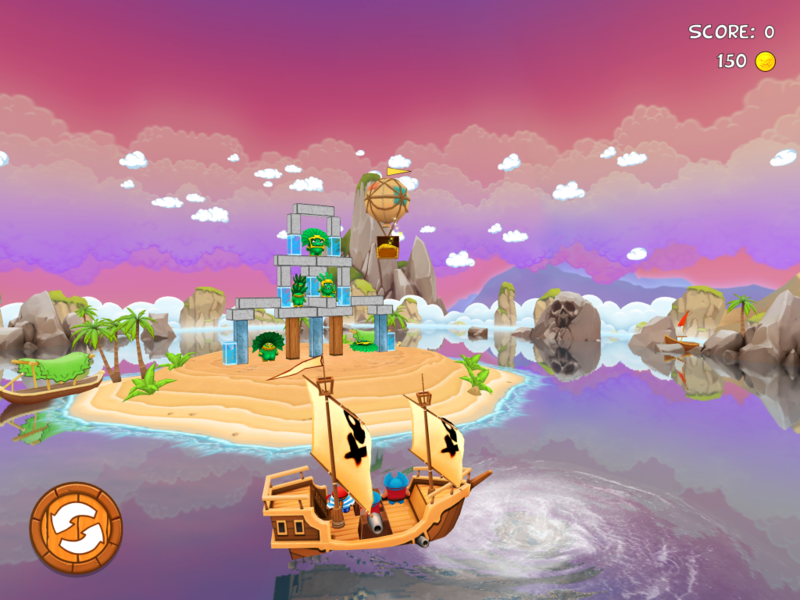 On some levels you are given the option of sailing your ship, with a swipe of a finger, around an island to get a better perspective or shot. This was a genuine surprise to me as the water effects are great, your finger touch sends ripples emanating out in a wonderfully satisfying way. For some reason you don’t just shoot cannon balls at the poor defenceless green guys, you strap pirates onto said balls. Each kamikaze pirate has a different effect, one is for pinpoint accuracy, another is for burning wood and another will smash rocks. You have no choice over who is on your ship for each level or what order you use them, at first you feel like this is unfair but then you remember everyone loved Angry Birds which did the same thing. With each victory you gain coins, these can be used for power-ups like a multi-shot cannon, a Gatling gun or finally the “Win Button” that is raising the Krakken. The Krakken isn’t even that expensive really and raises up like a giant octopus and just wipes away the scenery. Whilst useful this really is only useful as a “damn this level is confusing, I’ll just skip it” power-up. This game is fun but it isn’t without its flaws, the sound effects are mostly annoying rather than fun, the main title font (as you can see at the top of this review) uses a default Windows font which is somewhat jarring. Overall this game works great and plays great. The graphics are nothing special, apart from the water and rain effects, but much like the games I’ve compared it to, this is an excellent pick up and play game that will produce no end of satisfaction on completion.